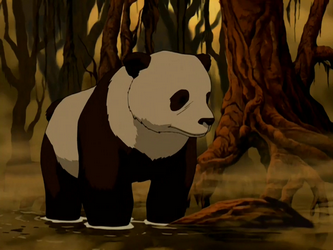 A vast range of fauna inhabit the World of Avatar; most of the animals presented are notably chimeras or crossbreeds of two real world animals, although there are execptions, such as bears and cats. There are several distinct habitats in the Avatar World, suitable for different animals and plants. Due to the wet climate and abundant vegetation, the Foggy Swamp plays host to a large variety of fauna. Hundreds of living things are densely packed into the swamp; this includes glowflies, elbow leeches, screeching birds, and catgators. The Great Divide has various species due to an arid climate. This unique area is home to certain creatures, such as the canyon crawlers. The Northern and Southern Water Tribe's low temperatures do not allow for much fauna to thrive. However, there are some animals that have adapted to the cold environment, such as otter penguins, tiger seals, polar dogs, polar bear dogs, and buffalo yaks. The Si Wong Desert has the driest, hottest climate in the world. The desert's ecosystem primarily consists of a few scavenger species such as the gilacorn, predatory insects known as buzzard wasps, giant rhinoceros beetles, which are used for transportation, scorpions, and jackalopes. Firefly — Bioluminescent flying insect. A flying bison female guides her calves to be chosen by young Air Nomads. 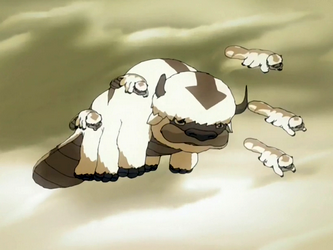 Flying bison — Large, flying mammal sacred to the Air Nomads as the original airbender. Hermit crab — Crustacean that outgrows and replaces its shell. Ring-tailed winged lemur — Flying gray primate kept as a pet. Winged lemur — Flying black and white primate kept as a pet. Arctic camel — A thick furred, two humped animal from the Southern Water Tribe used for transportation. Arctic hen — Arctic bird bred for its meat in the Southern Water Tribe; tastes quite similar to the possum chicken. Arctic hippo — Mammal that lives in the South Pole and is hunted for its blubber. Arctic seal — Swimming mammal native to the South Pole. Buffalo yak — Four-legged, furry, horned mammal used for transportation. Cuttlefish — Used to make paint that is applied for ceremonial markings. Dolphin piranha — A marine animal capable of eating humans. Fish — Various species are typically relied on for food in the Water Tribe. Koalaotter — Oceanic mammal with gray fur and large ears. Ming snake — Snake that lives in the South Pole; known to bite humans. Octopus — Cephalopod that lives in the sea. Otter penguin — Penguin with four flippers used for sledding. Polar bear — Non-hybridized arctic creature native to the Southern Water Tribe. Bones used in crafting weapons and pelts for carpets. Polar bear dog — A large, four-legged wild carnivore; it was historically feared and hunted by the Water Tribe, but can be tamed. Polar dog — Large dog; kept in Southern Water Tribe villages as a pet. Polar leopard — White leopard that preys on turtle seals; used for clothing in the Southern Water Tribe. Seal — Mammal whose skin is used to build tents. Sea sponge — Aquatic invertebrate. Tiger seal — Striped brown seal. Tiger shark — A powerful animal that is a cross between a tiger and a shark. Turtle seal — Brown seal with a hard shell. White hamster — Small, white rodent. Wolf — Canine that inhabits the polar regions of the Earth, including the North and South Poles. Yak — Large, four-legged herbivore. Ant — Small insect that lives in large colonies. Armadillo lion — Armadillo and lion cross. Badgermoles have facial stripes that resemble those of a badger. 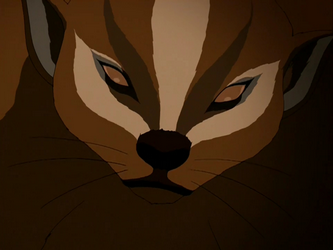 Badgermole — Enormous, subterranean blind mammals; the original earthbenders. Bear — Large brown, non-hybrid mammal known to hibernate; extremely rare. Beetle worm — Worm and beetle hybrid that is occasionally used as an ingredient in soup. Blue jay — Bird with blue feathers. Boar-q-pine — Large wild boar covered in sharp, detachable spines. Bumble fly — Buzzing, flying insect. Buzzard wasp — Enormous flying insect that resides within the Si Wong Rock. Cabbage slug — Small yet destructive agricultural pest. Camelephant — Four-legged mammal with a long nose; used for transportation. Canyon crawler — Insectoid, six-eyed, omnivorous creatures native to the Great Divide. Cat — There are numerous subspecies of cats, including a fluffy white tabby with green eyes, slim beige cat with patches of brown, and a bearded feline. Cat owl — Large, predatory bird with feline facial features. Catgator — Fierce reptile endemic to the Foggy Swamp and characterized by its feline barbels. Chameleon — Small, color-changing lizard with yellow eyes and a crest on its head. Chicken — Flightless bird bred for meat and eggs. Cranefish — Noisy birds found near coastlines. Creeping slime — An algaelike mass that crawls up the walls of the sewers in Omashu. Dog — Largely domesticated four-legged mammal. Dove — Agile white bird. Dragonfly — Flying, serpentine lizard that resembles a dragon. Duck — Farmed bird; often roasted. Eel hound — Amphibious four-legged creature; used for quick transportation over both land and water. Elbow leech — Enormous parasitic worm that attaches to elbows and feeds on human blood. Elephant koi — Massive oceanic koi fish. Elephant mandrill — Mandrill and elephant cross. Elephant rat — Black rodent with a large snout. Giant night crawler — Giant worm. Giant rhinoceros beetle — Giant beetle; used for transportation. Gilacorn — Small desert-dwelling, egg-stealing lizard. Goat dog — Small, shaggy, white canine kept as a pet. Gopher bear — Cross between a gopher and a bear. Goat gorilla — Aggressive primate which inhabits secluded mountains and woodland; are sometimes held in captivity and tamed. Hippo — Large, semi-aquatic mammal. Hog — Wild mammal hunted for food in forested regions. Hog monkey — Forest-dwelling ape with a squashed face. Hopping llama — Presumably a llama that can hop, as the name implies. Hoppy possum — Cross between a frog and a possum. Hybrid pigs — Includes the wooly-pig, moo-sow, picken, pigster, pig deer, bull pig, and pig chicken. Iguana parrot — Green reptilian bird with large talons. Jackalope — Jackrabbit with large antlers. Leech-a-pillar — Leech and caterpillar cross. Lop-eared rabbit — Nimble rabbit with long, drooping ears. Meadow vole — Small white rodent. Ostrich horse — Large brown bird commonly used for transportation. Platypus bear — Bear with a large bill and flat tail; lays edible eggs. Poodle monkey — Domesticated simian pet. Possum chicken — Bird hunted in the Foggy Swamp; tastes quite similar to arctic hen. Prickle snake — Serpentine creature which is known to hide in sleeping bags, posing a danger to its occupier. 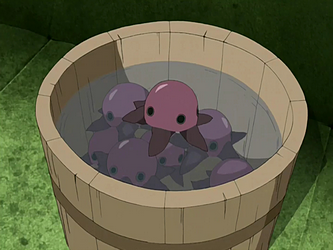 The purple pentapus has five eyes and five tentacles. Purple pentapus — Small cephalopod with five tentacles. Pygmy puma — Smaller and sleeker species of puma bred for and adapted to living in a compact city environment. Quilled chameleon — Reptile found in the densely forested regions. Rabaroo — Cross between a rabbit and kangaroo; young rabaroos are nurtured in their mothers' pouch. Saber-tooth moose lion — Moose and lion cross; cubs are not aggressive, but mature females are protective of their young. Scorpion — Venomous arachnid found in the Si Wong Desert. Screeching bird — White bird with a shrill, piercing call. Sea vulture — Scavenger bird that inhabits the western coast of the Earth Kingdom. 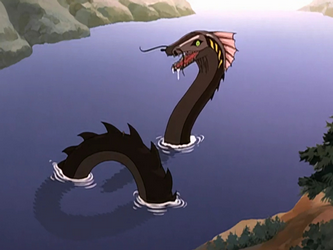 Serpent — Large aquatic creature that inhabits the East and West Lakes and is capable of dismantling a Fire Nation cruiser. Se tu — Large green catfish. Scorpion bee — Flying insect that gathers in large swarms and stings ferociously when aggravated. Shirshu — Large, eyeless mammal with a pink, star-shaped nose; has a keen sense of smell used for tracking and navigation. Singing groundhog — Small, brown, and furry rodent with a musical call. Skunk bear — Cross of a skunk and a bear. Skunk fish — Foul-smelling, oily fish. Sooty copper fritillary — Orange and yellow butterfly tracked by miners to uncover new mineral deposits. Sour beetle — Only creature in the Si Wong Desert the giant gilacorn would not eat. According to legend, the headpieces worn by beetle-headed merchants were crafted to mimic the appearance of a sour beetle, an intuitive trick that allowed the tribesmen to deceive gilacorns and avoid being attacked. Sparrowkeet — Small, colorful bird sometimes kept as a pet. Spider — Eight-legged arachnid capable of quickly weaving a web. Spider snake — Ten-eyed chimerical creature known to inhabit the Earth Kingdom. In gambling, rolling two fives is known as "spider snake eyes". Spider wasp — Cross between a spider and a wasp; known to have inhabited Yu Dao. Turkey duck — Turkey and duck hybrid. The unagi is mostly brown, with a pink dorsal frill. Unagi — Enormous eel that inhabits the South Sea. Viper bat — Serpent-like creature with bat wings found in caves. Wolfbat — Large, snub-nosed bat that resides within the Cave of Two Lovers. Wood frog — Amphibian with medicinal properties. Aardvark sloth — Used in the Sun Warriors' ancient city to clean off slime. Armadillo bear — Large bear with a hard, segmented shell. Badgerfrog — Green and brown frog with a trim of white fur. Cavehopper — White arthropod with four legs. Clam — Mollusk found in the Jang Hui River; outer shell blisters when its environment is ravaged by water pollution. Dragon — Large, flying reptile with a long body; the original firebenders. Dragon moose — Used for pulling carriages. Eagle hawk — Cross between an eagle and a hawk. Elephant rat — Elephant and rat cross. Flutter bat — A large bat found in the Fire Nation; it is a cross between a bat and a butterfly or a moth. Hippo cow — Domesticated and carnivorous mammal with black spots. Iguana seal — Green aquatic reptile characterized by its unusual call. Koala sheep — Koala and sheep hybrid. Komodo chicken — A cross between a komodo dragon and a chicken; can be consumed as food. Komodo rhino — Ferocious creature characterized by its versatility and ability to function over many different types of terrain; it is therefore useful as a cavalry mount, but is also used to make komodo sausages. Lion vulture — Vulture and lion cross. Maggot slug — A cross between a maggot and a slug. Meer penguin — A cross between a meerkat and a penguin. Messenger hawk — Messenger birds of prey with dark red or brown feathers. Mongoose dragon — Mongoose and basilisk lizard cross used for transportation. Panrilla — Panther and gorilla cross. Puma goat — A cross between a puma and a goat. Raven eagle — Avian animal that can be trained to intercept messenger hawks. Sea lion — Large aquatic mammal used to tug boats over the sea. Sea raven — Stylistically depicted in the emblem of the Southern Raiders. Sea slug — Large slug sometimes cooked for food. Squirrel toad — A small forest dwelling animal, it is a cross between a squirrel and a toad. Tigerdillo — A hybrid between a tiger and an armadillo; known for its roar and defensive nature. Tiger monkey — Hybrid of a tiger and a monkey. Toucan puffin — Sea bird with a large yellow bill. Turtle crab — Crab with a protective turtle shell. Turtle duck — Duck with a protective green shell. Fish — Aquatic fauna found in the ponds of Imperial City Park. Lizard crow — Lizard and crow cross that lives in urban areas. Ring-tailed winged lemur — Flying mammal found on Air Temple Island; closely related to the winged lemur. 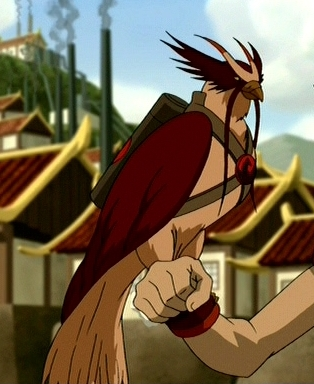 Rooster pigeon — SAn avian species located in Imperial City, especially by the docks. Spider rat — Lives within the houses of Imperial City and is considered to be an urban pest. Curly-tailed blue nose — Primate with brown fur. Dragonfly bunny spirit — Colorful, bunny-like spirits capable of flight. Hei Bai in his panda form. Forest spirit — Supernatural entity that watches over the forested regions of the northwestern Earth Kingdom. Giant wolf — Creature identical to an actual wolf with the exception of its gargantuan size. Hei Bai — Guardian spirit of a forest that normally assumes the form of a panda bear, but transforms into an aggressive monster with six limbs when enraged. 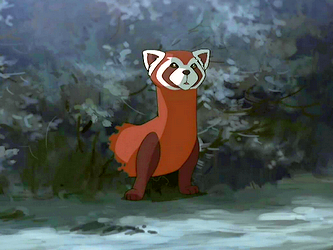 Knowledge Seekers — Foxes that assist the knowledge spirit, Wan Shi Tong. Koi fish — Physical manifestation of the spirits Tui and La, who correspond with the Moon and Ocean, respectively. 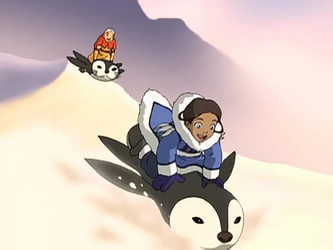 Two fish are found in the Northern Water Tribe's Spirit Oasis, one of which is primarily white and the other black. They continuously swim in a circle, performing an eternal dance of push and pull. Meerkat prairie dog — A cross between a meerkat and a prairie dog. Moth wasp — Moth and wasp cross; the wolf spirit has the ability to breathe these. Spirit World firefly — Bioluminescent insect. Wolf spirit — Spirit living near Hira'a. It is extremely large and has the ability to breathe moth wasps. Bunch hornet — A type of flying insect that disguises itself as fruit. Cat deer — Cross between a cat and a deer; it can be domesticated, and is large enough to be ridden. Chicken lizard — Cross between a chicken and a lizard. Elephant rhino — A large animal that is a cross between an elephant and a rhinoceros. Flying boar — Symbol of the Beifong family. Lion elephant — Cross between a lion and an elephant. A picture of a giant lion turtle shows a size comparison with a human. 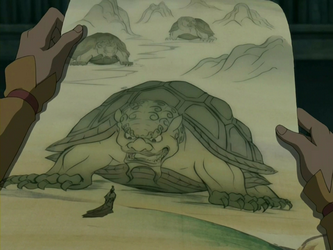 Lion turtle — An ancient species that can grow to immense sizes. Vegetation will occasionally sprout on its back, and cities are sometimes built on its shell. Meerpenguin — Cross between a meerkat and a penguin. Mongoose lizard — Cross between a mongoose and a lizard. Monkey marmot — Cross between a monkey and a marmot, known for its persistence in resisting domesticity. Opossum bat — Cross between an opossum and a bat, often used as an idiom ("playing opossum bat") to describe when someone is feigning defeat, death, illness, etc. Peacock pigeon — Cross between a peacock and a pigeon. Pheasant squirrel — Cross between a common pheasant and a squirrel. Phoenix — Large bird commonly associated with the element of fire, and a symbolic representation of the Phoenix King's power. Poodle pony — Cross between a poodle and a pony. Pythonaconda — Cross between a python and an anaconda. Rhino lion — Cross between a rhinoceros and a lion. Skunk squirrel — Cross between a skunk and a squirrel. Snail sloth — Cross between a snail and a sloth, and the slowest creature in the World of Avatar. Spider cat — Hybrid creature with brown fur. Spiderfly — Cross between a spider and fly that sometimes gets caught in its own web. Shark squid — A cross between an squid and a shark that is considered powerful and scary. Two-headed rat viper — Venomous snake with two heads. Walrus yak — Cross between a walrus and a yak. Weasel snake — Cross between a weasel and a snake, can be used as an insult toward someone who is conniving. Woodpecker lizard — Cross between a woodpecker and a lizard.